Article Excerpt: "... 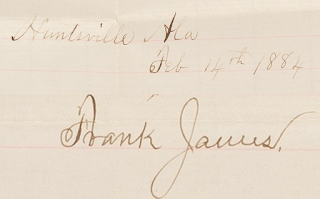 The first thing notorious outlaw Alexander Franklin "Frank" James did upon arriving in Huntsville in 1884 to stand trial was write a brief letter to let his wife know he arrived safely. If you have an extra $6,602 lying around, you can own this historical piece of mail: It's for sale by the owner through Heritage Auctions. Click here to see the listing ..."